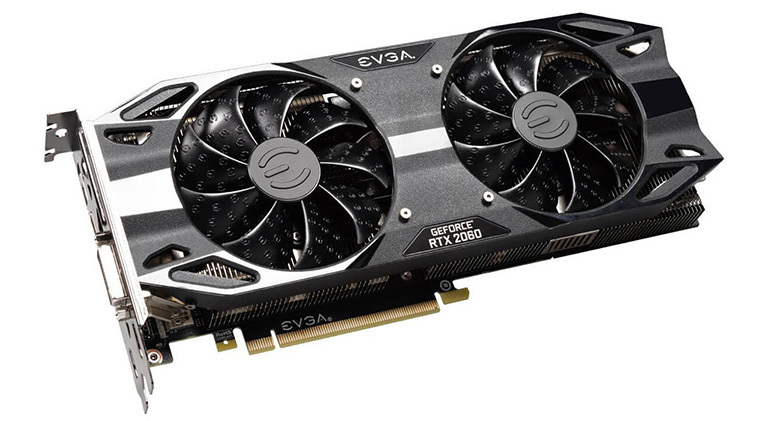 Nvidia has put its add-in board partners in a rather tight spot by releasing the GeForce RTX 2060 Founders Edition graphics card for £329. Those partners who can match this entry-level price do so with basic designs oftentimes lacking the build quality and overall aesthetic of the FE. Pushing the boat out with enhanced cooling and elevated core frequencies increases the cost, to improbably high levels in some cases, so it's hard to justify any partner card in lieu of that FE, at least in the UK. Yet certain companies have a loyal following and design philosophy that is able to mitigate the price premiums. EVGA can be put in this bracket, and it has no fewer than six RTX 2060 models in its line-up. Leading the charge is the XC Ultra, pictured above, and on paper it has most of the enthusiast bases covered well. Sticking to a strict dual-slot form factor, the 10.5in-long card uses twin hydro-dynamic-bearing fans that remain off at low loads. Power is sourced by a solitary 8-pin power connector and there's no over-the-top RGB lighting to spoil the attractive aesthetic. It's a shame that EVGA didn't go for the transparent appearance of the RTX 2070 cooler that we reckon looks even cooler. Still, this is how we imagine a decent, smart RTX 2060 to look like, unlike the hulking Asus cooler that's more at home on, say, the RTX 2080 or 2080 Ti. One may assume that EVGA would therefore play it safe with this model. The good news is the XC Ultra ships with an out-of-the-box core speed of 1,830MHz, which is as good as any other RTX 2060, meaning performance ought to match the best in the class. Memory remains at a stock 14Gbps. One ought to expect excellent FHD performance and pretty good numbers at QHD. The heatsink uses three flattened aluminium heatpipes that converge at a central block that makes good contact with the GPU. A further baseplate covers the memory chips and leaves space for the 8-phase VRMs, which are in contact with the main heatsink via thermal tape. It is interesting that EVGA uses a mini-ITX PCB here, evidenced by the location of the 8-pin power connector, with an additional plastic bracket installed to keep the one-piece heatsink level. As you can see here. The simple PCB removes the need for a rear brace/heatsink commonly seen on premium models; there really isn't anything to cool on the back side. TDP is 190W, or 30W more than default, enabling the card to hit a higher voltage/frequency curve than the FE. For those looking for extra performance by harnessing two cards, SLI is not supported on this model. Dual DisplayPort, HDMI and DVI are sensible inclusions, but like every other AIC board we have come across, EVGA removes the Type-C connector present on the FE card, presumably to save cost, but it does partner cards no genuine favours as they tend to be more expensive. EVGA charges £400 for this model, up from £329 for the FE, representing a 20 per cent hike. Sure, you get faster speeds, and our card cruises the benchmarks at a real-world 1,965MHz, compared to the FE's 1,845MHz, though we ponder if that is enough of an incentive to lay out the extra cash. Partners, it appears, simply cannot match Nvidia on price, and whilst this card feels expensive on first blush, it remains £55 cheaper than the same-clocked Asus and arrives at UK retail with the same outlay as others with this premium (1,830MHz) core frequency in place. 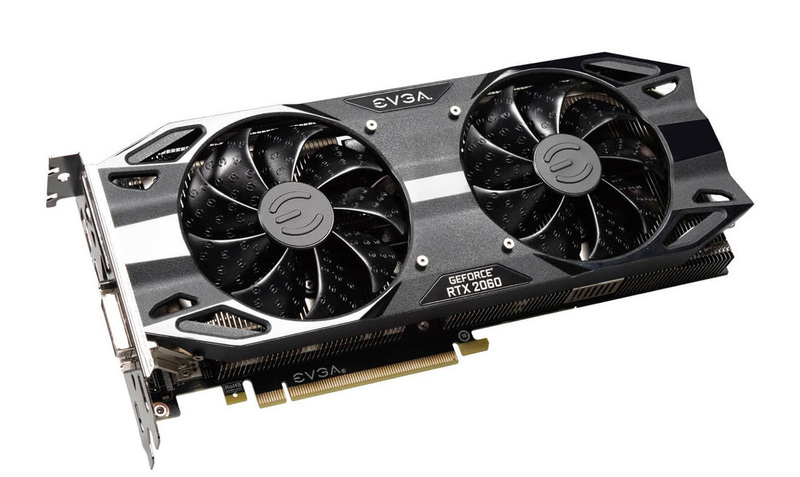 EVGA makes sensible decisions on how to construct its best RTX 2060. Let's now see if they pay off in the benchmark section.